FINALLY! ALICE GETS HER DUE! of these behaviors. 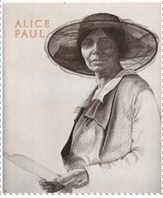 Whether or not they were true or exaggerated, it is a fact that Alice Paul has been overlooked by some historians and has been the subject of criticism by others. Her life began in 1885 in New Jersey as the daughter of two prominent members of the Quaker community, from which she acquired the values that would remain with her. Gender equality and education for women were integral values of her home and her community. Indeed, Alice’s education included a degree in Biology from Swarthmore College; a Masters of Arts degree from the University of Pennsylvania; a Law degree from the Washington College of Law at American University; and a PhD in Civil Law from American University. To say she was a formidable and brilliant student would be an understatement. Now that the political crazy season is in full swing, you can’t miss it–one rule for the men, another for the women. If you haven’t noticed, the sexist attacks are reserved solely for Hillary Clinton and other female candidates as they are for every woman who has ever had the temerity to run for office. Secretary Clinton has been accused of screeching, yelling, and screaming when she speaks to rallies of her supporters. Reporter Bob Woodward accused her of “shouting.” Really? When is the last time you heard anyone accuse a male candidate of “shouting” or “screeching?” The words conjure up banshees and witches and frightening female night creatures. Obviously, men are scared to death of powerful women. Clinton has also been criticized for being “too serious.” Joe Scarborough, on MSNBC’s Morning Joe, suggested Clinton needs to “smile more.” Can you imagine him suggesting that to a male candidate? And this is a campaign for the most important, powerful job in the country, not to mention the world. Our leaders need to be serious in a very serious world. Here’s wishing a very Happy New Year to all BPW-NC members and your families in 2016. We hope you had a wonderful time at our annual Holiday Party. We should all be pleased that we raised $541 (auction $449 plus floral centerpiece raffle $92) toward scholarships for re-entry women. Thanks to everyone for your participation. Now it is time to get to work again, defending the right of women to control their own lives and health. January 22 is the 43rd anniversary of Roe V. Wade when the Supreme Court declared that laws prohibiting abortion violated a woman’s constitutional right to privacy. And yet and yet……The reproductive rights rollback of 2015 was astounding and should be a warning call to us all. The endless parade of laws attempting to make it more difficult for women to get abortions, birth control and even minimal health care will not cease. They are part of an illegal, nationwide assault by politicians, right-wing agitators and religious fundamentalists (see Quiverfull below) on the individual rights of women to self-actualization. Since the beginning of 2011, there have been 288 abortion restrictions enacted by states. The trend accelerated in 2015, as state legislators passed 57 new constraints; hundreds more were considered and they will come up again in 2016. Disingenuous lawmakers will disguise them by claiming interest in protecting the health of women. Hogwash. A major lawsuit from Texas will be heard by the Supreme Court on March 2, 2016. The case involved a state law passed in 2013 requiring abortion clinics to meet the same building, equipment and staffing standards as surgical centers, a costly and medically unnecessary ruse. During our introductions at the October meeting, one of our members, Mona Matthias, said, “I do algebra problems for fun.” Everyone laughed. During the remainder of the meeting and after, I stewed about the laughter. Was it because most of us don’t think algebra problems are fun? Was it because Mona is a woman and there is a universally held belief that most women aren’t adept at math? To get to the answer I contacted Mona and asked if I could interview her. Before our interview, I looked back on my own high school years when algebra was a required subject. I had enjoyed it. But I made it clear that I didn’t like geometry. Ironically, my mother, who was an accountant, and my father, a building contractor, did not encourage me to take advanced math courses. They saw that I had a liberal arts bent and apparently they ruled out math as a compatible field of study. I grew up in an either/or world. Very few girls in my class studied math or math-related subjects. The girls who did were called “square” (the earlier term for “nerd” or “geek”) and teased about their math talents. That was decades ago, but now, in 2015, we still find it humorous that a woman could find algebra problems enticing. Mona and I sat down to discuss her education and her love of math, and we didn’t finish our conversation for two and a half hours. Although her BA is in English, she was interested in math from childhood and she recalls using math when she helped her father cut Sheetrock and build fences on their farm. She used math when she helped her mother cook and when she was sewing. Mona says she cannot remember NOT using math, and she has always enjoyed the challenges math presents. Let’s start with the good news. Viola Davis won an Emmy for Best Actress in a Television Drama for her lead role in “How to Get Away With Murder.” Aside from her enormous talent, Davis’ win is significant because she is the first African-American woman to receive this award. In her powerful acceptance speech, she quoted Harriet Tubman, and she also said, “And let me tell you something. The only thing that separates women of color from anyone else is opportunity.” In an industry which is well-known for its discrimination against women, particularly women of color, Davis shone some light on this practice. Give women of color the opportunity and they prove they can deliver. Give all women opportunities and they achieve. We’ve always know this and we will continue to demand opportunities for ourselves. Viola Davis’s Emmy is a good first step. The second piece of good news is that Democrats in the U.S. Senate, joined by some Republicans, blocked an effort on September 24th to deny federal funds for Planned Parenthood in a move that helped avoid a government shutdown. Forty-two Democrats, two independents and eight Republicans joined together to stop the anti-abortion effort on a procedural vote, 11 more than the 41 needed to block the legislation. We know that even though millions of women receive their health care through Planned Parenthood and not one penny of Planned Parenthood’s government funding is used to pay for abortions, there continue to be relentless attacks by right-wing politicians and their constituents. The Senate vote is a small but important victory for Planned Parenthood and the women who depend on it.